St. Bernard Breeders & Puppies For Sale If your a St. Bernard breeder and have St. Bernard puppies for sale, send us your details for free and we will add to our St. Bernard Breeders page. St. Bernard Rescue Center Visit the St. Bernard rescue centers if your looking to rescue a St. Bernard , as well as learn more about the breed or just support the rescue centers for there hard work. 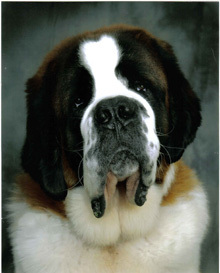 Origin / History The Saint Bernard is a large, ancient dog breed originating from Switzerland in the 17th century. 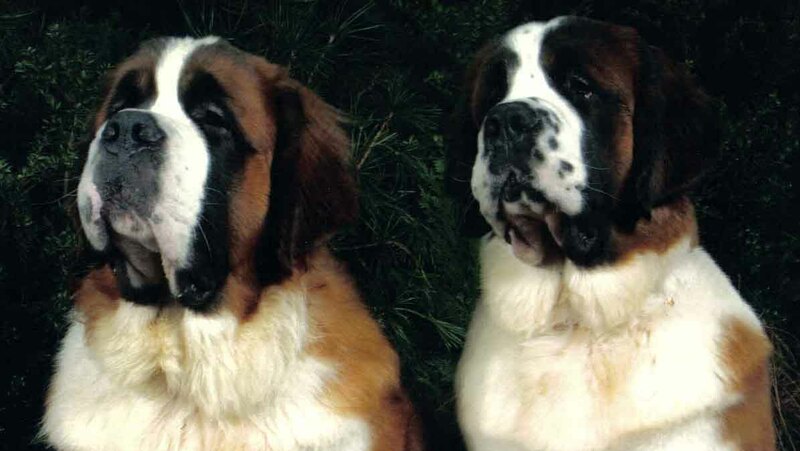 It was named after the Great Saint Bernard Pass connecting Switzerland and Italy, and a local lodge of the same name, where the dogs aided travelers in the notoriously perilous region. Tests have confirmed that it is related to the Tibetan Mastiff, and many believe it is a cross between this breed and the mastiffs that arrived in Europe around the year 1000. 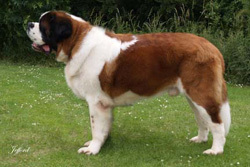 The breed is one of the largest in the world; the largest dog in history was a Saint Bernard named Benedictine, who weighed over 350 pounds. Modern Saint Bernards have been considerably tamed down, however, because of an avalanche that wiped out much of the original breeding stock. From rescue dog, it has evolved into an efficient watchdog and a loyal family companion. Appearance The Saint Bernard has a very large and powerful build and a tough, somewhat stern expression. There are two coat types, rough and smooth, but both are equally short, thick and dense. Rough coats are slightly longer and may be feathered on the thigh and leg areas. The muzzle is noticeably broad and the ears high-set, drooping sharply on either side of the head. Colours The coat can be white with red, yellow-brown or brindle markings, or red with white markings. The red can be any shade. There should always be white on the coat; white markings on the feet, chest, and the tip of the tail are very desirable. Temperament Saint Bernards are gentle giants. They are very calm, patient and affectionate, and they can be very protective of their families. They get along great with children, but adult dogs are best kept away as their size can be rather dangerous. Saint Bernards love to please and are always willing to help, whether it’s retrieving objects from the floor or simply keeping people company. Height and Weight 71 - 91 cm in height and 50 - 91 Kg in weight. Males are larger than females and at the top end of the size ranges. Common Health Problems Saint Bernards have very fast growth spurts, which can cause bone malformations if not given adequate exercise. They are also prone to hip dysplasia, elbow dysplasia, and other problems common to large dogs. Some lines are also genetically predisposed to osteosarcoma or bone cancer. Other common problems are ectropion and entropion (eyelid disorders), epilepsy, seizures, and heart disease. 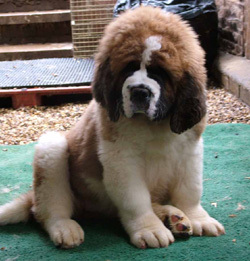 Living Conditions Saint Bernards are relatively inactive indoors and will do well in an apartment; however, they grow up to be very large and owners should make sure they have enough space. The ideal home is one with at least a small yard for the dog to walk around in. They can be sleep outdoors, but they’d much rather spend the night with their family. They don’t take to heat very well and should be kept cool at all times. Exercise Requirements Should not to be allowed to 'run' up & down stairs, gentle excersise for the first few months to help muscle development & social skills. Once dog grows & gets stronger, then walking a little further can be allowed. Generally 'free' play in a garden is usually sufficient until puppy is around 6mths old. Puppies tend to have weak bones, so exercise should be short and light for the first year. It’s important to keep the Saint Bernard’s weight in check, and exercise is the best way to do so. Long brisk walks every day are recommended, but the habit should be started early as the dog can become unmanageable as it grows up. Training Requirements Saint Bernards are an intelligent breed and shouldn’t be too hard to train. However, training should start early, when the dog is still of a manageable size. These dogs tend to be unruly and should be taught how to behave indoors; otherwise their clumsiness and sheer size can be destructive. Calm but firm training methods are usually the most effective. 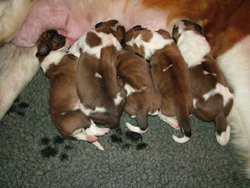 Life Expectancy Saint Bernards live an average of 8 to 10 years. Grooming Grooming is fairly easy as the coat is naturally rough. Occasional brushing and combing will prevent matting, especially during shedding season. Baths should be given only when necessary, as they can strip off the coat’s natural oils. Use mild soaps and shampoos to avoid irritating the eyes. Famous Examples Schnorbitz with Bernie winters & 'Nanna' from Peter Pan! Not forgetting the 'Beethoven' movies!! More St. Bernard Information: Check out our St. Bernard Clubs and links to more informative websites dedicated to the breed.